Surprisingly simple, this version relies on a ginisa base. It takes a little effort but try not to cheat with ginisa powders. Over medium heat, first sauté about a cup of roughly chopped onions and a head of chopped garlic till soft and broken down. A sprinkling of salt will quicken the process. This takes about 10 minutes or so. Just let the pan do the work and stir occasionally. Then throw in about a cup and a half of roughly chopped tomatoes. Again, a pinch of salt will help speed cooking things down. This takes another 10 minutes or so. You’ll want a really thick, deep red looking paste. And this reduced tomato base really makes a difference in imparting umami. I add about 2 tablespoons of achuete oil (done by throwing in a teaspoon of achuete seeds in hot oil and then straining them out) at this point to get a deeper red color. But it’s optional. Throw in about a kilo of chopped up, bone-in, chicken pieces. About a couple tablespoons of ginger slivers and maybe a couple of siling labuyo for heat. I put in five. That’s just me. Toss around then pour in about a cup of good vinegar. (I use a milder, sweetish palm). Add about ¼ to ½ cup water and do not stir at this point. Cover and simmer for about 10-15 minutes. Then finish off with about 2 tablespoons (or to taste) of good fish sauce. 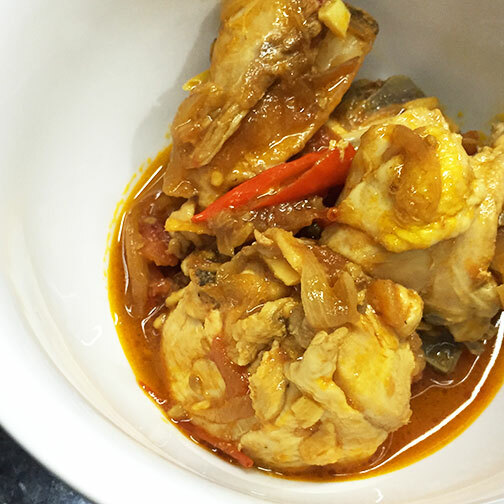 The gravy of this dish is just killer as it is composed mostly of the ginisa, the chicken juices and vinegar. I like cooking it down a little bit to concentrate flavors more. There’s a warmth from the ginger and the sauce just thickens up beautifully. There’s a slight heat from the chilis and the vinegar just lifts everything up. There’s umami from both the ginisa base and the fish sauce. Steamed white jasmine rice a must. Surprising how a simple traditional Filipino cooking method produces complex flavors. This dish sounds like a 2 or 3 cup rice meal with a glass of ice cold coke on the side. Yum. I tried it. It's like sarciado minus the egg.